Objective To investigate associations between Apgar score at five and 10 minutes across the entire range of score values (from 0 to 10) and risks of childhood cerebral palsy or epilepsy, and to analyse the effect of changes in Apgar scores from five to 10 minutes after birth in infants born ≥37 completed weeks. Design, setting, and participants Population based cohort study in Sweden, including 1 213 470 non-malformed live singleton infants, born at term between 1999 and 2012. Data on maternal and pregnancy characteristics and diagnoses of cerebral palsy and epilepsy were obtained by individual record linkages of nationwide Swedish registries. Exposures Apgar scores at five and 10 minutes. Main outcome measure Cerebral palsy and epilepsy diagnosed up to 16 years of age. Adjusted hazard ratios were calculated, along with 95% confidence intervals. Results 1221 (0.1%) children were diagnosed as having cerebral palsy and 3975 (0.3%) as having epilepsy. Compared with children with an Apgar score of 10 at five minutes, the adjusted hazard ratio for cerebral palsy increased steadily with decreasing Apgar score: from 1.9 (95% confidence interval 1.6 to 2.2) for an Apgar score of 9 to 277.7 (154.4 to 499.5) for an Apgar score of 0. Similar and even stronger associations were obtained between Apgar scores at 10 minutes and cerebral palsy. Associations between Apgar scores and epilepsy were less pronounced, but increased hazard ratios were noted in infants with a five minute Apgar score of 7 or less and a 10 minute Apgar score of 8 or less. Compared with infants with an Apgar of 9-10 at both five and 10 minutes, hazard ratios of cerebral palsy and epilepsy were higher among infants with a five minute Apgar score of 7-8 and a 10 minute Apgar score of 9-10. Conclusion Risks of cerebral palsy and epilepsy are inversely associated with five minute and 10 minute Apgar scores across the entire range of Apgar scores. Population based studies have shown that risks of cerebral palsy and epilepsy are increased in children with low Apgar scores, and a low Apgar score at five minutes confers a higher risk than a correspondingly low Apgar score at one minute.9101112 We are aware of only one previous study investigating risks associated with a low 10 minute Apgar score. This study showed that the risk of developing cerebral palsy was significantly higher in children with a 10 minute Apgar score between 0 and 3 compared with children who had a similar score at five minutes.13 No previous study has investigated risks of neurological disorders in children with more modestly depressed Apgar scores of 4-6 at 10 minutes or the risks of childhood neurological disorders across the full range of Apgar scores (that is, at each score value from 0 to 10). Changes in Apgar score values between one and five minutes are known to influence risks of cerebral palsy and epilepsy. Children with a low Apgar score of 0-3 at one minute and a normal score of 7-10 at five minutes have substantially higher risks of cerebral palsy and epilepsy compared with those who have normal Apgar scores (between 7 and 10) at both one and five minutes.1011 Although neurological morbidity may be influenced by changes in Apgar scores between five and 10 minutes, we are unaware of any study focusing on this question. If modest changes in normal Apgar scores (that is, changes within the range of 7 to 10) from five to 10 minutes influence risks, this would provide justification for continuing resuscitation of infants who have not attained an Apgar score of 10 at five minutes. In this population based study, we investigated the associations between Apgar scores at five and 10 minutes and risks of cerebral palsy and epilepsy in singleton infants born at term (≥37 weeks). We were particularly interested in examining the effect of a change in Apgar scores from five to 10 minutes, including changes within the normal range of Apgar scores. We hypothesised that risks of cerebral palsy and epilepsy would increase with decreasing Apgar scores, in particular at 10 minutes. We further hypothesised that even modestly depressed Apgar scores as well as minor changes between the five and 10 minute Apgar scores would influence risks of cerebral palsy and epilepsy. Between 1999 and 2012, the MBR contained information on 1 379 482 live singleton infants. After exclusion of preterm infants (<37 completed weeks, n=73 101), infants with congenital malformations (n=70 615), and records with missing data on maternal or child identification numbers (n=15 998), the study cohort included 1 219 768 live singleton term infants. Complete information on Apgar scores recorded at one and five minutes was available for 1 213 470 (99%) infants. Among infants with complete information on Apgar scores at one and five minutes, information on Apgar score at 10 minutes was available for 1 211 733 (99.9%). Identification of cases of cerebral palsy was based on the presence of one or more diagnostic codes for cerebral palsy (ICD-9 code 343; ICD-10 code G80), recorded between 1999 and 2012. Epilepsy in children was identified as follows1920: an occurrence of at least two diagnostic codes for epilepsy (ICD-9 code 345; ICD-10 code G40) on separate dates; or an occurrence of at least one diagnostic code for convulsions (ICD-9 code 780.3; ICD-10 code R56) and at least one diagnostic code for epilepsy, in separate medical encounters; the diagnosis of convulsions had to precede that of epilepsy. Diagnostic codes for cerebral palsy in all medical records were eligible for consideration. However, we restricted the diagnosis of epilepsy to the period after the child’s 27th day after birth, to avoid misclassifying neonatal convulsions as epilepsy. Only children with epilepsy who did not also have cerebral palsy were retained in the study (n=371 infants with epilepsy and cerebral palsy as a comorbidity were excluded). We considered the date associated with the first record of epilepsy or cerebral palsy to be the date of diagnosis, up to 16 years of age. Apgar scores at five and 10 minutes were the main exposures. 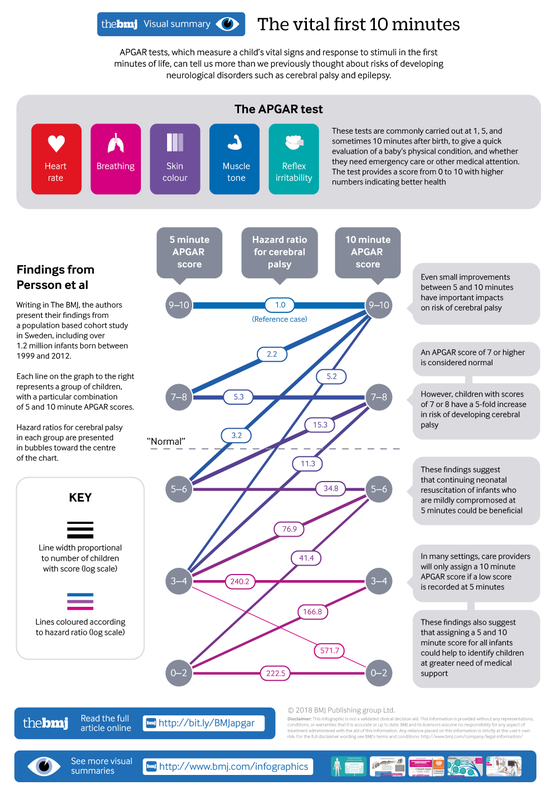 We analysed Apgar scores in several ways: revised categories (Apgar values of 0-2, 3-4, 5-6, 7-8, and 9-10) and each score value (Apgar values of 0, 1, 2, 3, 4, 5, 6, 7, 8, 9, and 10). Maternal characteristics of interest included age at delivery, country of origin, highest attained level of education, cohabitation with a partner, parity, height, body mass index, smoking during pregnancy, mode of delivery, and maternal epilepsy. We calculated maternal age at delivery as the date of delivery minus the mother’s birth date. We defined birth order (parity) as the number of births to each mother. We calculated body mass index (kg/m2) by using weight (wearing light indoor clothing) measured at registration to antenatal care and self reported height and categorised it according to the World Health Organization classification as underweight (<18.5), normal weight (18.5 to <25), overweight (25 to <30), obesity grade I (30 to <35), obesity grade II (35 to <40), or obesity grade III (≥40).21 The cohabitation status of the mother was obtained at the first antenatal visit. Mothers who reported daily smoking at the first antenatal visit and/or at 30-32 gestational weeks were classified as smokers, whereas mothers who stated that they did not smoke at either time point were classified as non-smokers. We defined maternal epilepsy before the child’s birth by using the same algorithm as for children. The covariate categories used are listed in supplementary table A. No patients were involved in setting the research question or the outcome measures, nor were they involved in developing plans for or implementation of the study. No patients were asked to advise on interpretation or writing up of results. There are no plans to disseminate the results of the research to study participants or the relevant patient community. Because the duration of follow-up differed between study participants born between 1999 and 2012, we estimated person time incidence rates of epilepsy and cerebral palsy. For cerebral palsy, children were followed from birth until the date of the first diagnosis of cerebral palsy, emigration, death, 16 years of age, or the end of follow-up (31 December 2012), whichever came first. For epilepsy, we followed each child from the 28th day after birth until the date of the first diagnosis of epilepsy, emigration, death, or end of follow-up (31 December 2012), whichever occurred first. We used Cox proportional hazard regression to estimate hazard ratios with 95% confidence intervals. Cox regression, which is a multivariable survival analysis model, accounts for varying duration of follow-up between study participants—that is, the varying duration from birth to date of diagnosis or end of follow-up. We specified the robust sandwich estimate of the covariance matrix to account for the correlations of sequential births to the same woman in the study. We used multivariable Cox regression analysis to compare the rates of epilepsy and cerebral palsy between children with differing Apgar score values at five and 10 minutes. Confounders included in the final models were based on the literature or statistical significance (P<0.10).2324252627 The full model included maternal factors (maternal age, country of origin, education level, and smoking) and birth characteristics of the child (birth order, gestational age (in days), birth weight for gestational age, and year of birth) (see supplementary table A). In analyses of epilepsy, we also adjusted rates for maternal epilepsy. Information on maternal body mass index was missing in 10.6% of all pregnancies, owing to missing values of maternal height, weight, or both. We therefore adjusted for maternal height and body mass index only in supplementary analyses. We assessed a linear trend in the association between Apgar scores at five and 10 minutes and offspring’s epilepsy or cerebral palsy by introducing a variable representing the ordinal categories of the Apgar score as a continuous predictor into the model. We used two sided P values of less than 0.05 to indicate statistical significance. We used the SAS software package 9.4 for all analyses. Rates of low (0-3 or 4-6) Apgar scores at five minutes in the study population generally increased with increasing maternal body mass index and decreasing height. Rates of low Apgar scores at five minutes were also higher in the offspring of non-cohabiting mothers but were not substantially influenced by maternal age, education, smoking, country of birth, or year of delivery. Apgar scores of 0-3 at five minutes were equally common in offspring of mothers with and without epilepsy, but scores of 4-6 were more common in offspring of mothers with epilepsy. Rates of low Apgar scores differed by mode of delivery, and the highest rates were recorded in offspring delivered by emergency caesarean section. With respect to gestational age, the highest rate of low Apgar scores was observed in post-term infants (≥42 weeks); rates of low Apgar scores were higher in small for gestational age infants compared with offspring born at appropriate weight for gestational age and in boys compared with girls (supplementary table A). In the study cohort, 1221 (0.1%) children were diagnosed as having cerebral palsy, corresponding to an incidence rate of 1.5/10 000 child years. Compared with children with an Apgar score of 10 at five minutes, children with lower Apgar scores had increased hazard ratios of cerebral palsy (fig 1). Hazard ratios of cerebral palsy consistently increased with decreasing Apgar score values: from 1.9 in children with an Apgar score of 9 at five minutes to 277.7 in those with an Apgar score of 0 at five minutes. Low Apgar scores at 10 minutes were associated with even higher hazard ratios of cerebral palsy. Compared with children with an Apgar score of 10 at 10 minutes, a 10 minute Apgar score of 3 was associated with a hazard ratio of 425.5 for cerebral palsy, whereas hazard ratios for cerebral palsy in children with Apgar scores of 7, 8, and 9 at 10 minutes were 18.7, 9.1, and 2.4, respectively. In total, 3975 (0.3%) children were diagnosed as having epilepsy, corresponding to an incidence rate of 5.1/10 000 child years. Compared with a five minute Apgar score of 10, Apgar scores of 0 and 3 at five minutes were associated with adjusted hazard ratios of 11.9 and 4.4, respectively (fig 2). Hazard ratios of epilepsy decreased with increasing Apgar scores but were significantly increased in offspring with a five minute Apgar score of 7 or less and in offspring with a 10 minute Apgar score of 8 or less. Low Apgar scores were more strongly associated with epilepsy at 10 minutes than at five minutes. The adjusted hazard ratios for epilepsy among children with 10 minute Apgar scores in the 0-3 range had wide 95% confidence intervals because of small numbers of children in these categories. In children with missing Apgar score at 10 minutes, rates of cerebral palsy and epilepsy were 3.0/10 000 child years and 4.2/10 000 child years, respectively (data not shown). Table 1 shows hazard ratios of cerebral palsy in relation to changes in Apgar score from five to 10 minutes. As expected, the highest hazard ratios were seen in offspring with a very low Apgar score at both five and 10 minutes. Increasing Apgar scores from five to 10 minutes were associated with decreasing hazard ratios of cerebral palsy. Compared with children with an Apgar score of 9-10 at both five and 10 minutes, the adjusted hazard ratio for cerebral palsy was 5.3 in children with a score of 7-8 at both five and 10 minutes. 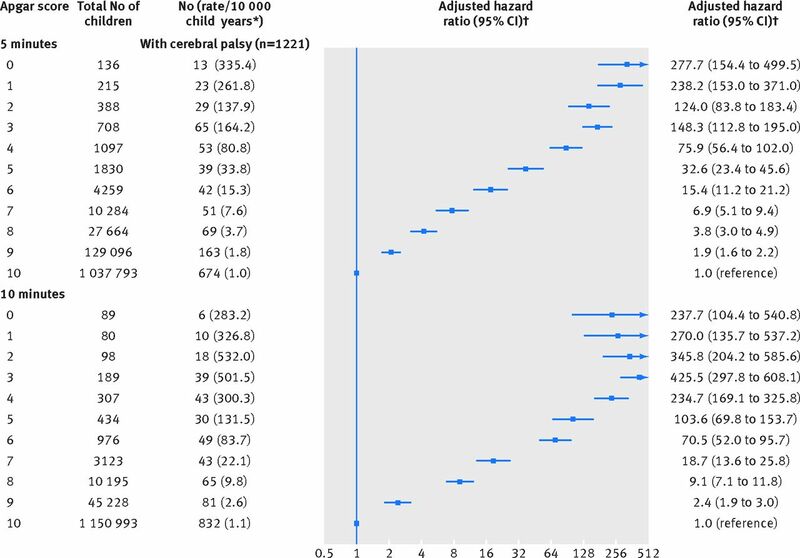 Hazard ratios for cerebral palsy were also significantly higher among infants with a five minutes Apgar score of 9 and a 10 minute Apgar score of 10 compared with infants who had an Apgar score of 10 at both five and 10 minutes (adjusted hazard ratio 1.3, 95% confidence interval 1.0 to 1.5; table 1). 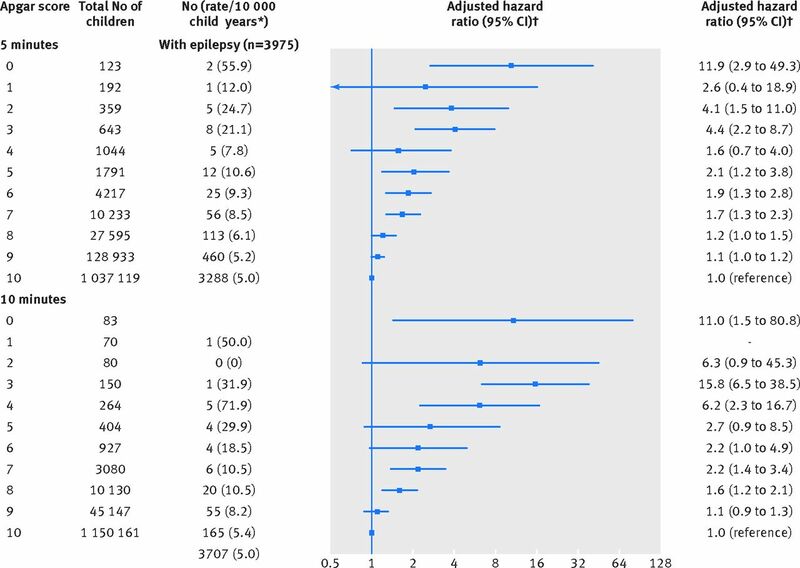 The corresponding adjusted hazard ratios for epilepsy showed less pronounced associations (table 2). Compared with infants with an Apgar score of 9-10 at both five and 10 minutes, the hazard ratio for epilepsy was 1.3 in infants with a five minute score of 7-8 and a 10 minutes score of 9-10, and the adjusted hazard ratio was 1.5 for infants with an Apgar score of 7-8 at both five a 10 minutes. Adjusted hazard ratios for epilepsy were significantly higher among children with a five minute Apgar score of 10 and a 10 minutes score of 9 (table 2). In supplementary analyses, we additionally adjusted for maternal body mass index and height, which did not substantially change associations between Apgar scores and cerebral palsy or epilepsy (supplementary table B). Although hazard ratios for cerebral palsy were higher following emergency caesarean and operative vaginal delivery (compared with an elective caesarean delivery and spontaneous vaginal delivery), hazard ratios for cerebral palsy increased with decreasing five minute Apgar scores regardless of the mode of delivery (supplementary table C). This population based cohort study found increasing risks of epilepsy and especially cerebral palsy with decreasing Apgar scores at five and 10 minutes. For both outcomes, the risks associated with a lower Apgar score at 10 minutes were generally higher than those associated with a similar score at five minutes. Notably, an Apgar score of 9 or lower at five or 10 minutes conferred increased risks of cerebral palsy, whereas risks of epilepsy were increased among those with Apgar scores of 7-8 or less at five and 10 minutes. Furthermore, risks of cerebral palsy and epilepsy were increased in offspring with a five minute Apgar score of 7-8, even if the 10 minute Apgar score was 9-10. Our findings expand on those of previous studies reporting risks of cerebral palsy and epilepsy associated with Apgar scores at one or five minutes.910111228 This study is, to our knowledge, the first to investigate risks of cerebral palsy and epilepsy in relation to Apgar scores at 10 minutes and across the whole range of scores. The increased risks associated with Apgar scores of 8 and 9 are highly noteworthy and worrisome; a 10 minute Apgar score of 8 was associated with a hazard ratio of 9 for cerebral palsy, and a 10 minute Apgar score of 9 was associated with a hazard ratio of 2.4 (fig 1). Our study also quantifies the risks of cerebral palsy and epilepsy associated with changes between five and 10 minute Apgar scores. The finding that children with five minute Apgar scores of 7-8 and 10 minute Apgar scores of 7-8 have higher hazard ratios of cerebral palsy and epilepsy (hazard ratios were 5.3 and 1.5, respectively) is concerning and warrants critical attention from the resuscitation community. However, our study also had some limitations. Cerebral palsy and epilepsy are heterogeneous conditions with varying causes, clinical presentation, severity, and prognosis. We did not investigate the effect of Apgar scores on risks of subtypes of cerebral palsy or epilepsy. The study period spanned 13 years, and advances in obstetric and neonatal care over this time may have influenced outcomes. Induced hypothermia in term infants with hypoxic ischaemic encephalopathy may reduce risks of death and neurodevelopmental disorders.293031 This treatment was introduced in Sweden in 2007, national coverage began in 2010, and the therapy is now strongly recommended by the Swedish National Society for term infants with perinatal asphyxia. However, we did not have information on obstetric and neonatal interventions and were unable to explore the effect of this treatment. Nevertheless, our analyses adjusted for year of birth, and this would have potentially overcome the effects of temporal changes in neonatal care. Lastly, we cannot rule out possible influence of other unmeasured or unknown factors. Cerebral palsy and childhood onset epilepsy are serious neurological disorders associated with increased risks of morbidity and mortality.2526 The causes of cerebral palsy and epilepsy are multifactorial,252732333435 but prenatal and perinatal events are important risk factors for both conditions. Cerebral palsy is commonly referred to as an umbrella diagnosis with reference to cause, severity, and symptoms. Awareness of the importance of an early diagnosis of cerebral palsy is increasing given that cerebral palsy can often be diagnosed before 5 months of age. Early identification of cerebral palsy and active intervention may alter neuroplasticity and optimise the child’s psychomotor development.36 Seventy per cent of children with cerebral palsy are born at term, and the cause of cerebral palsy differs between preterm and term infants. Data from animal studies suggest that brain injury secondary to ischaemia/hypoxia is a more prevalent cause of cerebral palsy in term children than in preterm children.25 Hypoxia may lead to energy depletion, oxidative stress, and inflammation, ultimately resulting in cell death.25 However, a comprehensive review by Ellenberg and Nelson states that only a small proportion of all cases of cerebral palsy are due to perinatal asphyxia.37 Reduced vitality in term born infants has a variety of potential causes with clinically similar manifestations. For example, maternal fever and inflammatory conditions are common antecedents of low Apgar scores, depressed respiration, and other symptoms that are also common in hypoxia. Thus, other adverse prenatal or perinatal events, equally deleterious to the developing brain, including inflammation in the maternal/fetal compartments,38 may have contributed to our findings.37 Nevertheless, in our study of children born at term, perinatal hypoxia may be one of the underlying factors that contributed to the increased risks of cerebral palsy among infants with lower Apgar scores. Several risks for epilepsy have been identified, including both maternal and perinatal factors.3539 We have previously shown increased risks of epilepsy in newborns with neonatal infections, hyperbilirubinaemia, hypoglycaemia, and respiratory disorders.39 These conditions are more frequent in infants with low Apgar scores. Results of the current study are in line with previous reports, showing elevated risks of epilepsy in offspring with decreased Apgar scores at one or five minutes after birth.911 Our findings of higher risks of epilepsy with low Apgar scores at 10 minutes (compared with low Apgar scores at five minutes), and also the findings of higher risks associated with changes in five and 10 minute Apgar scores within the normal range, may facilitate identification of infants at high risk. Maternal obesity has previously been associated with increased risks of low Apgar score, cerebral palsy, and epilepsy.394041 In this study, adjusting for maternal body mass index in early pregnancy did not substantially change risks, indicating that maternal obesity does not modify the relation between Apgar scores and severe neurological disorders in children. Mode of delivery may affect Apgar scores. We found that risks of cerebral palsy associated with Apgar scores differed by mode of delivery, and the highest risks were observed for offspring delivered by emergency caesarean section. A more detailed analysis of the underlying reasons behind this finding was not possible, as we did not have information on indications for elective or emergency caesarean sections. We found increasing risks of epilepsy and especially cerebral palsy with decreasing Apgar scores at five and 10 minutes in offspring born at term. Importantly, even a slight decrease in Apgar scores at five or 10 minutes (scores of 8 or 9 for cerebral palsy and scores of 7 or 8 for epilepsy) increased risks of cerebral palsy and epilepsy. Although an increase in Apgar score values from five to 10 minutes improved outcome, the risks of cerebral palsy and epilepsy remained higher among children with an Apgar score of 9-10 at 10 minutes if their five minute Apgar score was 7-8. Even an Apgar score of 9 at five minutes and a 10 minute score of 10 was associated with a slightly increased hazard ratio for cerebral palsy, and the hazard ratio for epilepsy was increased in infants with a full score at five minutes and a 10 minute score of 9. This is of particular interest as in many settings, neonatologists, midwifes, and other care providers will assign the newborn a 10 minute Apgar score only when a low five minute Apgar score is noted. We believe that our findings are widely applicable and provide justification for assigning all newborns an Apgar score at one, five, and 10 minutes and continuing active neonatal resuscitation of infants who are mildly compromised at five minutes. Contributors: MP and NR contributed equally to this paper. NR, SC, KSJ, and KT conceived and designed the study. All authors acquired, analysed, and interpreted the data and critically revised the manuscript for important intellectual content. MP drafted the manuscript. NR did the statistical analysis. SC obtained funding and provided administrative, technical, or material support. NR and SC are the guarantors. Funding: This study was funded by the Swedish Research Council for Health, Working Life and Welfare (grant No 2014-0073), by the Stockholm County Council (ALF project 20150118 and a clinical postdoc position to MP), and by an unrestricted grant from Karolinska Institutet (No 2368/10-221, distinguished professor award to SC). NR is supported by a postdoctoral fellowship award from the Canadian Institutes of Health Research (CIHR). KSJ is supported by the BC Children’s Hospital Research Institute and a chair award from the CIHR (APR-126338). Funders were not involved in the design and conduct of the study; collection, management, analysis, or interpretation of the data; or preparation, review, or approval of the manuscript. Competing interests: All authors have completed the ICMJE uniform disclosure form at www.icmje.org/coi_disclosure.pdf and declare: no support from any organisation for the submitted work other than that described above; no financial relationships with any organisations that might have an interest in the submitted work in the previous three years; no other relationships or activities that could appear to have influenced the submitted work. Ethical approval: The study was approved by the Regional Ethic Review Board at Karolinska Institutet, Stockholm, Sweden (No 2011/195-31/2). Transparency: The lead authors (MP and NR) affirm that the manuscript is an honest, accurate, and transparent account of the study being reported; that no important aspects of the study have been omitted; and that any discrepancies from the study as planned (and, if relevant, registered) have been explained.
. How often is a low Apgar score the result of substandard care during labour?BJOG2010;117:968-78doi:doi:10.1111/j.1471-0528.2010.02565.x. Swedish National Board of Health and Welfare. The Swedish Medical Birth Register: a summary of content and quality. 2003. https://www.socialstyrelsen.se/Lists/Artikelkatalog/Attachments/10655/2003-112-3_20031123.pdf. Swedish National Board of Health and Welfare. Quality and content in the Swedish Patient Register. 2009. http://www.socialstyrelsen.se/Lists/Artikelkatalog/Attachments/8306/2009-125-15_200912515_rev2.pdf. Statistics Sweden. Evaluation of the Swedish register of education. 2006. http://www.scb.se/statistik/_publikationer/BE9999_2006A01_BR_BE96ST0604.pdf. World Health Organization. Global Database on Body Mass Index: BMI classification. http://apps.who.int/bmi/index.jsp.
. Neurology.3rd ed. Saunders, 1998: 717-23.
, eds. Cerebral palsy: science and clinical practice.Mac Keith Press, 2014.